Trouble finding your passion or purpose? If so, you need to stop trying to find the perfect passion or purpose. If you’ve been trying, and you’re stuck, it’s time to try something else. It’s time to discover what works for you. 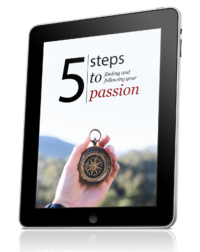 I wrote a book called Find Your Passion: 25 Questions You Must Ask Yourself. Am I now saying that what I wrote is useless? For many, answering the questions in my book is an excellent starting point. But if you’ve done that, and you’re still stuck, then you need to uncover the cause of that stuckness. If something doesn’t work for you, find another way. Absorb what is useful. Discard what is not. Add what is uniquely your own. One path is seldom the right one for everyone. You have to find what works for you, and eliminate everything else. You’re afraid of what might happen, so you look for perfection, thinking it will guarantee your desired outcome. You grapple with a fear of failure, fear of criticism, fear of not being good enough, fear of making mistakes, and on the list goes. You believe that if you can just find the right path, the right passion, everything will be okay. But that line of thinking is a lie. See life as an experiment, a testing ground. Instead of attempting to find the perfect passion, let it reveal itself through tasting life. Notice what you’re interested in, and take a tiny step in that direction. You may be afraid, and that’s okay. You get through fear by taking action anyway. When you do, you slowly realize that your mind doesn’t know everything. And because your mind isn’t all-knowing, you don’t have to take it so seriously. You can simply enjoy the dance that we call life. Below is a video on this topic. The video and article complement each other, so I recommend you watch/read both. And if you want more videos, subscribe to my YouTube channel, because I don’t post everything here on the blog. The article continues after the video. Since 2002, I’ve been following my heart. I’ve done that by taking tiny steps toward what resonates. A tiny step could be as simple as reading a page in a book, sending a 2-sentence email, or writing a one paragraph story (if you enjoy writing). When you’re stuck, you live in abstraction. You’re stuck in your mind. To escape, bring your attention to this moment. Instead of worrying about what’s to come, ask yourself: What feels magnetic to me right now? What next step can I take toward what makes me come alive? Worries and fears will surface. When they do, re-focus on what you can do with what you have, right now. Below is a video on the power of living in the present moment. What If You Fall Flat on Your Face? You get back up, dust yourself off, and put one foot in front of the other. You extract the lessons, and you move on. As you move forward, the wisdom from your failures becomes the fodder for your success. Do you realize that you only really need one real success? You can fail 100 times, but if you uncover gold one single time, everything changes. Entrepreneurship is about failing until you succeed. The problem is that most people avoid failure, so they never get to extract the wisdom necessary for success. If something keeps you stuck, discard it. If you can’t find your passion or purpose, forget about it, at least for now. Focus on what is interesting to you, right now. Look at what you’re able to do + what you find interesting. Then take a tiny step in that direction. That’s all I’ve done. I have no idea where I’m going, but I move toward what calls me. The more I’ve done this, the more I’ve realized that my mind is full of fake news. I don’t have to take it so seriously. I can just enjoy life. Indeed, to be authentic and do what you like most pays real happiness in life. This article has added value to my life. My goal was to take on as much paid work as possible in my current employment even though my current employment isn’t not my passion, previously I had been cautious not to take on a big work load because back then I felt it was more important to find and do work that I was interested in and made me feel happy. I had a feeling of – I’m not good enough, I’m a failure, not worthy of good things, And I quickly noted judgmental, resentful and thoughts coming up for me constantly and repetitively. That’s a powerful insight. Thanks for taking the time to share, Amelie. I appreciate it, and I’m sure others will, too! Glad you like it, Adriana!